We love Anthropologie. The brand’s clothes are a wondrous mix of casual-chic, formal, rock ‘n’ roll, professional and so much more, all featuring the coziest fabrics around. Almost anything we need, we know we can find it at Anthropologie and we’re going to look like we stepped straight out of a magazine in our new outfits. We freak out when we see our wishlist items in the sale section, and we double-freak out when we see our favorite magic words: “Extra 40% off.” Basically, we are freaking the freak out right now. We picked out and rounded up some of the best deals and cutest looks and are pumped to show them off. Yes, we had to do a double-take too. These are velvet jeans. Such an incredibly luxe way to dress up an outfit while still wearing jeans! These high-waist bottoms are slim all the way from waist to ankle and elongate legs flawlessly. And don’t worry about comfort level. Citizens of Humanity creates its pants with “unparalleled comfort” as one of the top goals, along with flattering fits, of course! The color is to die for, and we’re gushing over how well it would go with metallic accessories. And let’s not forget the heavenly softness! We love it all. Who doesn’t love a little taste of red velvet? See it: Grab the Citizens of Humanity Olivia Ultra High-Rise Velvet Slim Ankle Jeans (originally $188) for just $66 after an extra 40% off at Anthropologie! Discount reflected in cart. We’ve truly found the best of both worlds! A biker jacket that doubles as an adorable winter sweater? We just died and went to heaven (a.k.a. Anthropologie). This ett:twa jacket is slightly cropped and features edgy faux leather with a black and white wool front. There’s virtually zero chance of not hearing, “Oh my gosh, where did you get that jacket?” when you slip this unique piece on with either jeans or maybe even a midi dress. Shoppers are loving it too, one saying they “just adore everything about it.” Same! 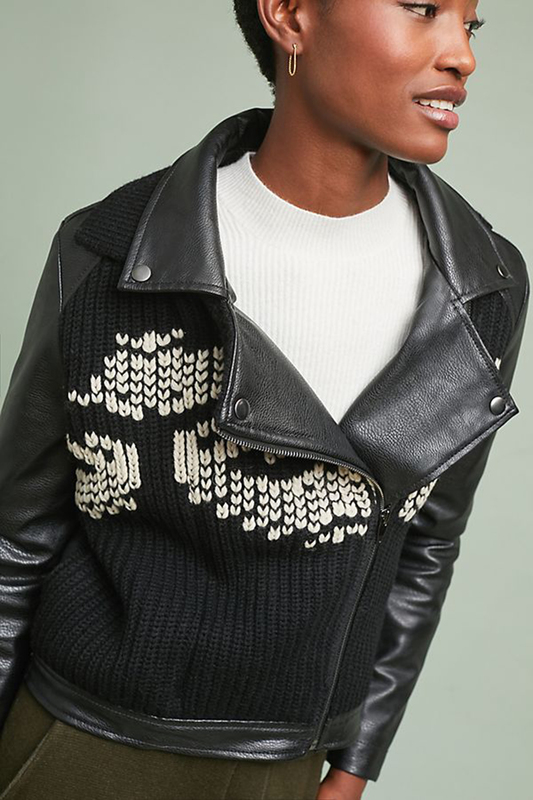 See it: Grab the ett:twa Sweater Moto Jacket (originally $218) for just $78 after an extra 40% off at Anthropologie! Discount reflected in cart. Sometimes in colder weather we start to miss the fun look of tying our shirts in cute knots over our denim shorts. No more of that, because we’ve found the solution! Swap the shorts out for pants and swap the top out for this waist-tied tunic! The tie adds a cute element that sets it apart from other sweaters, and the mock neck is a modern and classy touch. Even better? This tunic comes in both red and black and both shades are on sale! See it: Grab the Michael Stars Waist-Tied Tunic (originally $228) for just $78 after an extra 40% off at Anthropologie! Discount reflected in cart. How comfortable do these COA joggers look? Are they acceptable to wear both to bed and out to dinner? Rhetorical question — we’re doing it regardless. We can’t beat the price and we’re so into the heathered look, the cropped ankle and the playful textures. We haven’t even mentioned the best part yet, which is the way to any shopper’s heart: It has pockets! The best place to stick all of our secrets, like the fact that Anthropologie also has a matching top! These joggers come in taupe and navy shades and we can’t pick a favorite. Please don’t make Us choose! See it: Grab the Winter Retreat Joggers (originally $68) for just $24 after an extra 40% off at Anthropologie! Discount reflected in cart. Looking for a professional top that’s still fashionable and not too stuffy? This gorgeously textured Eva Franco top is the answer. Flouncy sleeves are super in right now, and one shopper noted how they really help accentuate the waist even more than the tie already does. We also love that this top comes in both black and a deep red wine shade. Eva Franco aims to craft exquisite silhouettes, and this is no exception. Before buying, take note that this style runs large and sizing down might be the way to go! 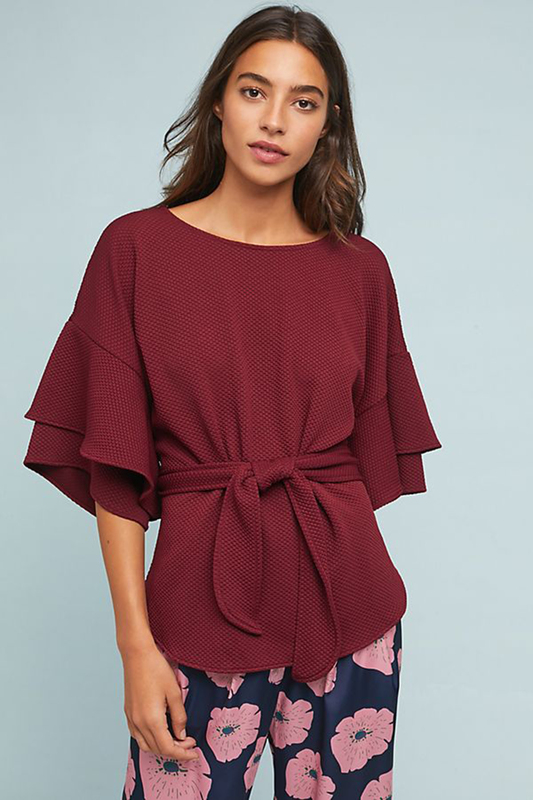 See it: Grab the Laszlo Textured Top (originally $98) for just $30 after an extra 40% off at Anthropologie! Discount reflected in cart. Looking for more? Check out even more deals at Anthropologie here!